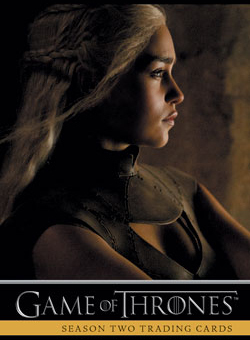 Following up on its enormously successful debut set, 2013 Rittenhouse Game of Thrones Season 2 trading cards continue to offer in-depth coverage of both the show and its massive cast of characters. The 88-card base set provides plots synopses for all ten episodes of the show's sophomore season. Like the first set, a good chunk of the 2013 Rittenhouse Game of Thrones Season 2 base set is also dedicated character profiles. The cast is so big that this should help viewers, particularly casual ones, get the connections between them a little more. Base set parallels are inserted every third pack. Autographs will, once again, be a big part of the set, with more than 40 different signers. Among the signers are Peter Dinklage, Emilia Clarke, Sophie Turner, Natalie Dormer, Rose Leslie, Lena Headey. 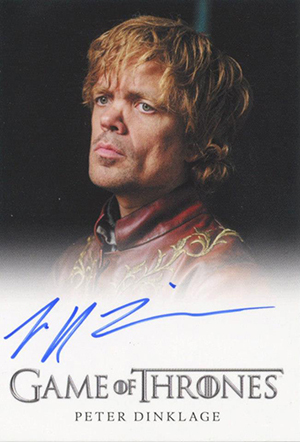 Like the Season 1 set, autographs have two different designs, Full-Bleed and Bordered. Every box has a pair of signed cards. 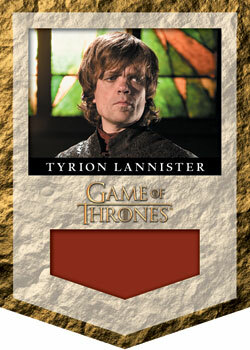 Relic Cards debut for the first time in a Game of Thrones set, featuring items used in the making of the show. There are 20 different memorabilia cards, which fall 1:48 packs. Rittenhouse is upping the number of basic inserts. 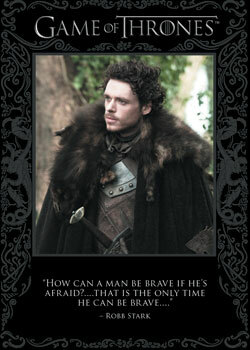 Quotable cards (1:12 packs) continue with another nine cards. Twenty Storyboard Art cards (1:12 packs) look at the making of the show. 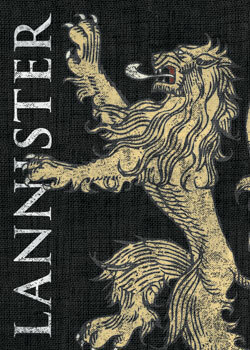 Family Sigil cards (1:24 packs) give a distinct look at the different factions that make Game of Thronestick. Finally, six Gallery cards (1:48 packs) offer stellar shots of key cast members. Sketch cards make their debut in the product. The artist checklist is extremely limited. Sean Pence and David DesBois are the only solo artists. DesBois is also teaming with Charles Hall on some pieces. 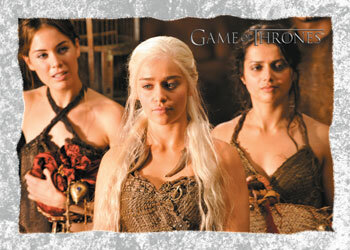 2013 Rittenouse Game of Thrones Season 2 has incentive cards from some of the creative minds behind the show. 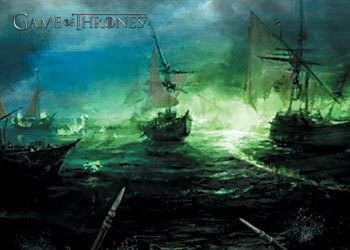 For every three cases ordered, dealers get an autograph from either David Benioff or D.B. Weiss, both executive producers for the series. The six-case incentive is an autograph from author George R.R. Martin, who also serves as a co-executive producer. 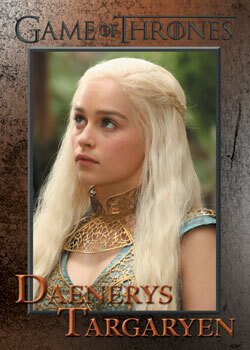 For every 18 cases, dealers receive a 2013 Rittenhouse Game of Thrones Season 3 Archives Box. 63 Sandor Clegane "The Hound"
46 cards. Inserted 1:12 packs. View a full guide to all 46 autograph cards here. 6 cards. Inserted 1:24 packs. 6 cards. Inserted 1:48 packs. 10 cards. Inserted 1:12 packs. Q20 exclusive to Rittenhouse Rewards program. 20 cards. Inserted 1:48 packs. 20 cards. Inserted 1:12 packs. These cards and items are given to dealers based on pre-orders. Dealers receive one of the three-case incentives at random for every three cases ordered. I hope they include James Cosmo. Been looking for an authentic autograph from the man for nearly 30 years – since Highlander. I hope they include Liam Cunningham! 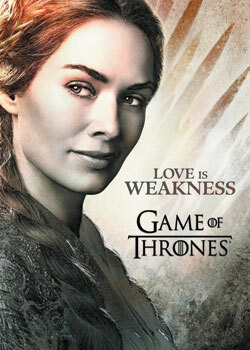 I wonder if they have Carice van Houten as a signer. That would be awesome.